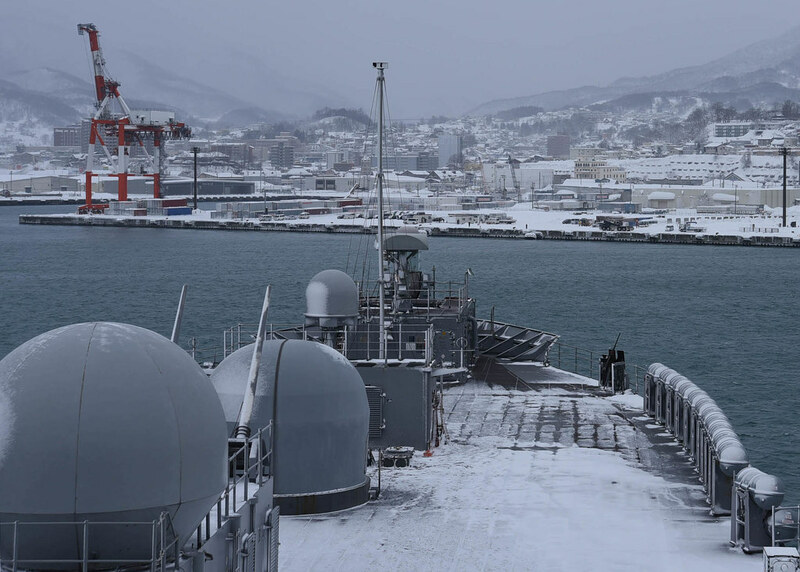 OTARU, Japan - USS Blue Ridge (LCC 19) and embarked 7th Fleet staff arrived for their first port visit to Otaru, Japan, in nearly five years, Feb 8. The port visit is also Blue Ridge’s first since completing a two-year maintenance period. It reflects the enduring strength of the U.S.-Japan alliance and 7th Fleet’s commitment to the Japanese people. As part of the port call, Blue Ridge crew members and embarked 7th Fleet staff will take part in several community relations (COMREL) events that build on the longstanding friendship between American and Japanese citizens. The COMREL events include a friendly basketball game with Otaru Meiho High School students and volunteer work at the Snow Light Path Festival. "I see this as a chance to learn about Japanese culture outside of what I’ve learned about in Yokosuka," said Personnelman 3rd Class Razi Nil, one of Blue Ridge’s COMREL participants. "Being a part of creating and continuing our relationships with the people here as an ambassador for the Navy is an unbelievable experience." Blue Ridge recently completed nearly two years of extended maintenance and numerous certifications to ensure it remains ready to promote regional security and stability. Capt. Eric J. Anduze, Blue Ridge's commanding officer spoke on the importance of the visit in light of the long maintenance period. "In order to protect our interests and those of our partners, we must work closely with our Japanese hosts, and this port visit is an essential piece of that mission," he said. Our relationship was highlighted over the last three years, as the Blue Ridge crew worked hand-in-hand with our neighbors to refurbish our fine warship. It is due to everyone's hard work, both Navy and civilian, that we are able to be here today." Blue Ridge serves under Commander, Expeditionary Strike Group 7/Task Force 76, the Navy's only forward-deployed amphibious force. Blue Ridge is the the oldest operational ship in the Navy and is responsible for patrolling and fostering relationships within the Indo-Pacific region.